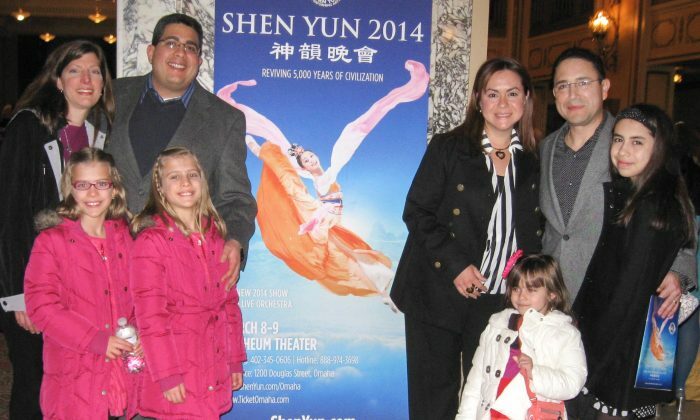 OMAHA, Neb.—Doctors Diego Torres, Douglas Inciarte, and their families attended Shen Yun Performing Arts Touring Company’s performance at Omaha’s Orpheum Theater on March 8. “It was marvelous, impressive, the movements, the synchronization of the artists was really impressive,” said Dr. Torres, assistant professor of the Department of Neurological Sciences at the University of Nebraska Medical Center. He is also director of the Movement Disorder Program and the Assistant Director of the Neurology Residency Program. Shen Yun, based in New York, aims to revive five millennia of Chinese culture through classical music and dance. Dr. Inciarte is a faculty member of the University of Nebraska Medical Center. He specializes in traditional family medicine. The performance really expanded his knowledge about China through Shen Yun. “I never imagined how much diverse culture, how much cultural information, or how much [was] in the dancing, or how the cultures evolved in China,” Dr. Inciarte said. Part of Shen Yun’s mission is to revive the values of traditional Chinese culture, once considered semi-divine. Thus, many of the 20 or so short dances and songs deal with spiritual issues. “The spirituality, I think, was very deep. I never imagined how religious the Chinese culture could be—very respectful of religion, respectful of nature and animals, … and I was really impressed with how much richness that culture has and spirituality as well,” he said. In tracing the spiritual heritage from ancient times, Shen Yun also explores the current state of spirituality in China. Traditional values are no longer esteemed there. In fact, Shen Yun cannot perform in mainland China. “I was really impressed with how repressive the expression of artists actually is in China. I never imagined that happening, so the show was great,” Dr. Inciarte said. Dr. Inciarte would definitely recommend Shen Yun to others so that they might learn how diverse and rich the culture is. What was the feeling the performance left him with? “Great! he said.